Griffith Park is filled with amazing little hikes - one of my favorite being the Fern Dell trail. I am so fond of this trail because it offers the best of both worlds. Fern Dell consists of two distinct sections. The first, lower section, is a lush tropical garden bursting with wild flowers, succulents and ferns. The trail follows a creek that is full of crawfish and goldfish with rustic footbridges and benches along the way. It's hard to believe you're actually in Los Angeles as you stroll through this area. Soon the trail opens up to a nice (dusty) shaded pic-nic area. Just past the pic-nic area you'll find a few trails that lead out to the sunlight - a vastly different hiking experience from the beginning of your trip. 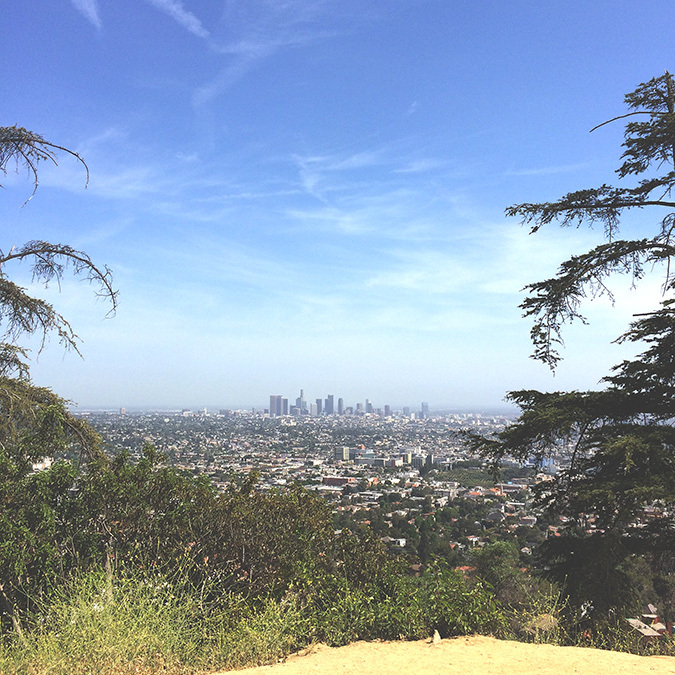 The hike up to the observatory is generally exposed, so make sure you layer on the sunscreen and are ready to sweat because it's all uphill from here! At this point I recommend taking the trail to the left up towards the Observatory - the trail on the right hand side is a bit steeper and more exposed (if you prefer you can follow this trail from the top junction back down to the bottom to make a loop). Eventually as you make your way up the mountain you'll come to a junction. If you are facing the junction you'll notice it splits into three different directions - left leads you back down to Fern Dell, middle dead ends just beneath the Observatory and the right trail leads you directly up to the Observatory - the right hand trail is the one you want to continue with. Not long after this you will reach the Observatory! I highly recommend exploring and taking in the views from here. Once you're finished simply follow the trail back down to the bottom - they all pretty much spit you back out to where you started! How to get there: From Los Feliz Blvd. (a block east of where Western Ave. dead ends into Los Feliz), turn north onto Fern Dell Drive. Follow Fern Dell Drive about a quarter of a mile in and you notice parking along the street.